She was a Christian and a member of a large, loving family. She was the daughter of the late John and Lena Hoover Campbell. Her extended family included eight of the 10 siblings born to John and Lena. Judy loved Disney characters, especially Mickey Mouse. She enjoyed attending church at Bloomington Chapel Brethren in Christ, where the congregation returned her affection for them in immeasurable abundance. She will be greatly missed. 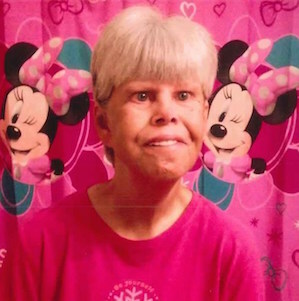 Judy Ann Campbell, 63, of Columbia, KY, died Saturday, March 24, 2018 at 5:12pmCT, at her home. Funeral service for Judy Ann Campbell, will be at 1pmCT, Wednesday, March 28, 2018 at Grissom-Martin Funeral Home, 200 Campbellsville Street, Columbia, KY, with Bro. Ralph Foster officiating. Burial will be in the Lewis Cemetery in the Chance community. Visitation will be after 4pmCT, Tuesday, March 27, 2018 at the funeral home. She was born Tuesday, October 19, 1954, in Joliet, IL. She was the daughter of the late John and Lena Hoover Campbell. She died Saturday, March 24, 2018, in Columbia, Adair County, KY, at the age of 63 years, five months, and five days. In addition to her parents, she was preceded in death by a sister and brother-in-law; Barbara and Johnny Harden; and a brother; Kenny Campbell. Judy enjoyed attending church at Bloomington Chapel Brethren in Christ Church. Grissom-Martin Funeral Home, 200 Campbellsville Street, Columbia, KY is in charge of arrangements. 2018-03-26 - 200 Campbellsville Street, Columbia, KY - Photo from Grissom-Martin Funeral Home.